On the hunt for a new riflescope? As a hunter or range shooter, you know how important a quality, easy-to-use scope is to your experience. With so many to choose from, finding the right one can be a difficult choice. Selection can be even more complicated if you factor in price and quality. Who wants to deal with a cheap, underperforming scope? And who wants to spend half their paycheck on one? If you’ve been struggling to find the right riflescope, here’s your answer. 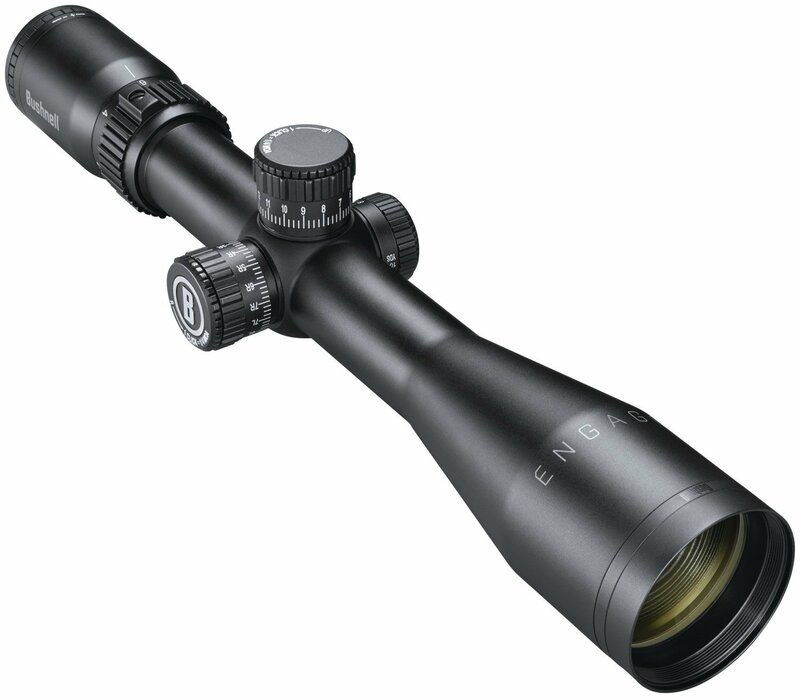 The Bushnell Engage Riflescopes are high-quality and affordable. They also boast a number of exciting features that will make your next hunt or day on the range a great one. The Engage riflescopes were designed to go to work with you. Everything, from the turrets to the lens, is waterproof and built to last. The scope is heavy enough to be stable, but no so heavy it’s not useable for long-range work. They come in nine configurations, so whether you’re varmiting, game-hunting, or are out on the range, you can find the right model for you. Find the 30 mm tubes here and the 1″ tubes here. The Engage riflescope feature multicoated glass with Bushnell’s new EXO Barrier protective coating, which actively repels water, debris, oil, and fog. Even fingerprints–really! Everything just slides right off. The EXO really helps keep your scope clean and your vision sharp even, with rugged use. No need to concern yourself about image quality. On each model, you’ll find multiple layers of anti-reflective coating and 90% light transmission. You’ll get great color, amazing resolution, and fantastic details, even well into dusk and even at night. If there’s a light source—even the moon—you’ll get a great picture through this scope. These riflescopes are also O-ring sealed and nitrogen-purging for full protection against water and fog. You can count on an ultra-clear view, rain or shine. The scope’s blackout interior keeps out any extra reflection. Plus, the adjustments feel clean and work well. Keep in mind, the diopter doesn’t lock. So, if you may need to make a little mark on your setting in case it gets bumped. Scope also includes an already-installed Butler Creek pop-open scope cover. Engage riflescopes include Bushnell’s new Deploy MOA reticle. This gives shooters 1-MOA windage and elevation hashmarks and can reach both short and mid-range targets. Vertical and horizontal crosswires are marked at 1 MOA intervals, and bigger, thicker marks delineate each 5 MOA intervals. The Bushnell Engage Riflescope offers a huge range of reticle correction. There are 20 MOA of reticle correction possible to the left and right. Above center to low hold, you’ll get 5 MOA of correction, and 30 MOA of correction below center to hold high. Although the reticle is easy to read and use, the markings may be a little thin. If you’re running out of light, or are have a complicated background, you may lose reticle visibility. Further, because the reticle is found in the second focal plane, you need to spend the time adjusting the magnification if you’re shooting at long range. The riflescope must be set at its highest magnification to apply the reticle marks correctly. Bushnell obviously took their time on design. The MOA reticle can be used by hunters and target shooters across multiple calibers. If you’re looking for a scope that provides flexibility—this is the one. The turrets on these Bushnell Engage riflescopes are great. They are marked with very readable numbers with .25 MOA marks between each number. One rotation of the turret gives you 15 MOA of correction. Rotate the turrets as many times as you want, but you’ll eventually get passed the 50 MOA of built-in adjustment. They also lock; to make an adjustment, pull up and twist. Then, press back down to keep in lock. Once your scope is sighted, you can set the windage and elevation to zero without using a tool. Just unscrew the top disk. It’s a pretty cool feature! You can do the same to other turrets to return everything back to the original zero. The side parallax adjustment is also easy to use. Depending on the scope you get, it will adjust all the way down to 10 yards and up to infinity, with graduations at 20, 30, 50, 100, 200, 300, & 500. The short-range parallax adjustments are really nice if you are mounted on a .22, or are hunting in close range. The Bushnell Engage riflescopes are truly an incredible value. High-quality glass, sturdy construction, and clean design make these riflescopes on par with some of the most expensive on the market. With their Engage line, Bushnell has proven you don’t need to spend half your paycheck on a ha great scope. It’s also important to remember the Bushnell Engage products come with an Ironclad lifetime warranty—for the scopes, it’s 30 years. The Bushnell Engage line of products includes binoculars. Read more about them here.